I am a book lover from way back and as such know the need for an abundance of good bookmarks! Check out these 6 easy to DIY Bookmarks you can make for your reading habit. We took it a step further and included a couple of fun ways to repurpose old books. I enjoy reading but I absolutely love books in general! I learned to love books as a child when my parents gave me Louisa May Alcott’s Little Women for Christmas when I was about 9 years old. It remains my all time favorite book and I even still have that original book on my shelf. DIY bookmarks are a fun project for adults and children especially during the winter months while shut inside. The children may be a little more likely to enjoy reading when they get to use the fun bookmarks they made themselves. I made the Ribbon Bookmarks with my granddaughter and I know how excited she was to begin using hers. El’s Journey created these Ribbon Book Marks by repurposing old tissue boxes! Super simple to make with only scissors, ribbon, glue and the tissue boxes. (El is no longer blogging) Her tutorial is under the photo. Kleenex boxes come in beautiful patterns and colors. Take the box apart and lay it flat. Cut two pieces large enough to lay one on top of the other. Then cut two shapes to your liking through the double layer. Cut a piece of ribbon to glue between the two pieces of cardboard. Dab Elmers glue on the back side of one piece of the cardboard. Place one end of the ribbon onto the glue leaving plenty hanging out. Place the matching piece of cardboard on top and press down. These are almost free to make and if you leave a long tail of ribbon, you can easily find your place in the book. Tally’s Treasury made these adorable and quite popular Page Corner Bookmarks. These can be made with only paper, scissors, glue, pencil and a few decorative pieces of your choice. 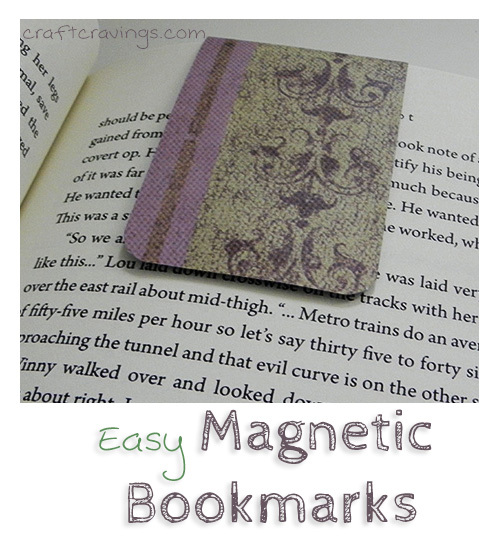 A nice twist to this page corner bookmark is to make them with any decorative paper, without the monster eyes. Be creative! These cute little Craft Stick Bookmarks are from CraftsbyAmanda.com. They are a fun project for the kiddos with only a few simple supplies needed. There are actually two different tutorials; pencil bookmarks and The Avengers bookmarks. Easy Ribbon Bookmarks by me! Full Tutorial Here for how to make these Ribbon Bookmarks. Short version video below. Craft Cravings has changed her blogging format and removed content. An easy tutorial follows. Visit Craft Cravings for how to learn crafts by yourself. Cut your craft paper to about 1/2″ x 6″. Peel and stick the magnet to the craft paper. Boom! You are done. 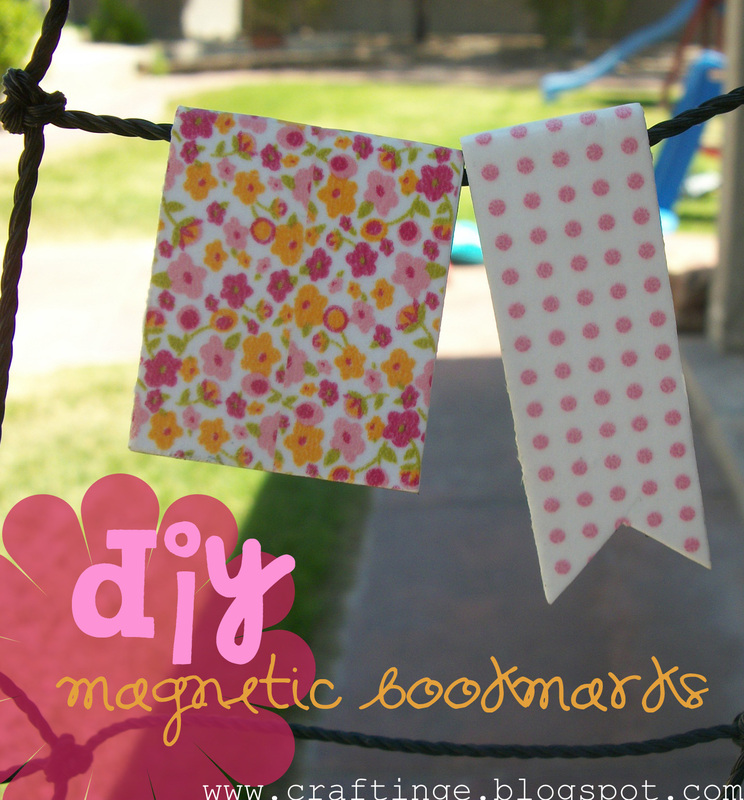 These magnetic bookmarks were made by Craftinge.blogspot using Washi tape! Amazingly beautiful are these Hymn Page Feather’s over at todolwen.ca. These beauties may require a little more work but will be such fun to hold your book pages! Just a couple of fun ways to repurpose old books! I cannot bear the thoughts of throwing away a book! Can you? This creative repurposed book lamp is awesome and so unique! All of the instructions including step by step pictures are available from HGTV here. Oh my…I love these ideas! SO creative!! Such a great list for the book lover on your gift list! I love them all! I am going to make a few of them today during nap time. Thanks for sharing on our Bloggers Brags Weekly Pinterest Party. I love your posts that you share. Hi Misty, Thanks for stopping by. I love the Bloggers Brags Linky’s! Y’all rock! Hi Shirley. Love the post. It’s so great to see all the ideas and to feel that I’m a part of the crafting community. Neat to see that several of us have similar ideas right? Also nice to see these all in one place. Thanks for putting it all together. Happy to link to your great post El. I love your beautiful blog! Are you on Pinterest yet? Thanks, Kristen. I have been working on all sorts of blogging things. It is a slow process but will get there eventually. In our house there are always some books lying around. My daughter visited the library so much, that she finally started working there. Books are just great! We are the same person, Shirley! I love to read and have been an avid reader since the first grade! I made pumpkins from book pages to use as part of my centerpiece this past Thanksgiving. Everyone was very impressed! I love all of the fun ideas you have showcased today, especially the lamp. Love it! I have always thought I would make those pumpkins with the pages. I love to see those, I’m sure it was nice. We do have a lot in common and southern girls too!